Mired in dust on the afternoon of June 10, 2018, NASA’s Opportunity rover received a final command from Earth. Take a photo of the sun, the Deep Space Network sang in code. Send telemetry. The rover’s cameras could barely see through all the swirling dust, which had been blown aloft by a planet-spanning storm. 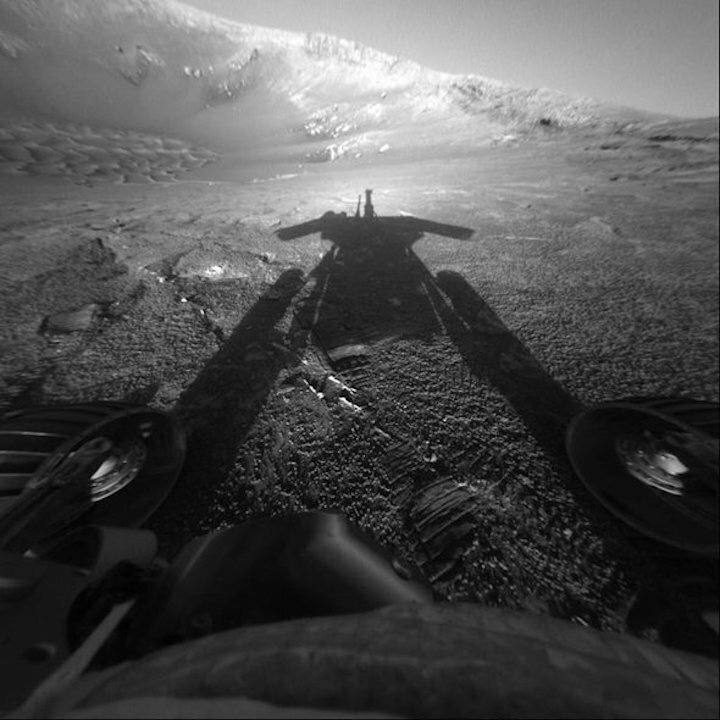 The sky was darkening, and Opportunity’s batteries, powered by sunlight, were draining. The reply was grim. The last transmitted image showed solar radiation was one fortieth its pre-storm level. Power was low: just 22 watt-hours, down from a normal 300 watt-hours on the solar panels. That’s enough to run a typical food processor for about five minutes. Minders on Earth prepared to let Opportunity hunker down for the dust storm, the worst such event ever witnessed in the more than four decades robots have been occupying Mars. On June 10 the rover woke up briefly, but its energy was too low to send a message home, and it fell silent. In the following weeks Opportunity would grow cold. Everyone hoped that once the winds died down and the Martian skies cleared, the solar panels could charge enough to rouse the rover and prompt it to call home. So Opportunity waited, and everyone who cares about it also waited while Mars calmed down. Finally in September came good news from the other side of the planet; orbiters and the Curiosity rover saw the atmosphere clearing. Yet Opportunity lay silent. People at NASA began trying to wake it up. By January 22, they had sent 600 recovery commands. These lines of code cannot, by design, be plaintive. But humans can, and many of them started sending messages of their own. The messages were as much to one another as to the rover, and they were largely the same: Wake up, Oppy. Come back. Oppy did not. Last week NASA officials announced a new set of commands were being beamed to the still-silent rover instructing it—pleading with it, really—to reset its clock and cycle through its radio antennas. But even optimists admit this last-ditch effort has a low probability of success. Very soon, it seems, the agency will be forced to declare the rover’s mission complete—and the storied Mars Exploration Rover program officially over. Opportunity has endured for 15 years on the Red Planet, 61 times longer than its 90-day warranty. In NASA’s family of interplanetary explorers Opportunity will be survived by its rover descendant, Curiosity, as well as its cousin the InSight lander. It has been preceded in death by its closest kin—its twin, Spirit. As they grappled with the growing certainty the rover had met its end, several of the mission’s scientists and engineers were philosophical, even celebratory in their measured optimism. But their sadness is palpable. “You can always look back and say, ‘This is a rover that way outlived her expectations and accomplished a lot.’ But that doesn’t make the grief go away,” says Mark Lemmon, an atmospheric scientist at the Space Science Institute. “It’s odd to think about grief being associated with a machine. But it’s a part of our lives. We worry about it; we think about its power, its usage of energy, like a care-and-feeding kind of thing. It’s not just a piece of machinery. It obviously is that, but also something that’s connected to everybody. We’ve gone through 15 years of living our lives, with operating the rover on Mars being the one constant thing in that,” he notes. Spirit and Opportunity, also known by their formal title as Mars Exploration Rovers A and B, are well equipped robot geologists. They each are outfitted with a five-foot-tall, camera-topped neck called a mast, along with rock-grinding tools, scoops and multiple spectrometers to suss out minerals and rock compositions. They were designed to last three months—and NASA sent two partly because the agency wanted to hedge its bets in case one didn’t make it. “No one, on the engineering team or the science team, had the foggiest idea that Opportunity would still be operating after 15 years. It’s just a well-made American vehicle,” says Ray Arvidson, the mission’s deputy principal investigator and a planetary scientist at Washington University in Saint Louis. Together, they totally changed everything we know about the planet most like Earth. Opportunity landed on Mars January 25, 2004, in a small depression called Eagle Crater, just 20 days after Spirit landed on the other side of the planet. Abigail Fraeman was 15, obsessed with astronomy and Star Trek, and was at the Jet Propulsion Laboratory that night after winning a contest sponsored by the Planetary Society. Today Fraeman is the rover’s deputy project scientist, and until June she spent her days working with engineers and scientists to design the rover’s activities. After her night at JPL she went on to study planetary geology in college and attended graduate school at Washington University, where she studied with Arvidson. Many Mars geologists earned their doctorates under his tutelage; his office in the Earth and Planetary Sciences Department serves as an Opportunity hub as well as the home of the Planetary Data System, which archives and distributes every piece of information U.S. robots have gathered from other rocky worlds. Washington University is Opportunity’s spiritual home, in a sense, along with mission control at JPL and the rover research office at Cornell University.